Family is often thought to lie at the core of American life, so it is not surprising that the family, with its psychological, sexual and economic highs and lows, has dominated American novels and plays. In exploratory tribute to this phenomenon, New York Theatre Workshop has embarked on a series called somewhat coyly “Cradle and All: The Changing American Family.” NYTW’s third and most recent entry is Peter Gaitens’s stage adaptation of Michael Cunningham’s mammoth 1995 work Flesh and Blood, which follows a Greek immigrant and his descendants from 1935 to 2035. But despite astute direction and exquisite acting, from a cast of 11 playing 24 characters, this gargantuan play demonstrates the perils of bringing a novel to the theater. 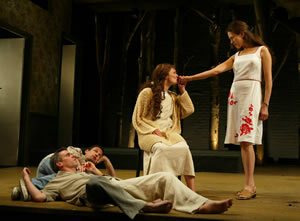 Certainly NYTW’s wide stage is an apt platform for this adventure, and designer Christine Jones uses it to advantage. Here are all the hallmarks of the traditional American home, with a difference. Trees rise at the rear of the stage, silhouetted against the back wall like ghosts from a rural past. A giant wooden pier juts into the middle of the stage and forms a staircase. Off to the sides, doors punctuate the stage walls. Shortly after the play begins, Scott Zielinski’s subdued lighting picks up actors climbing among the trees, from where, like a chorus, they momentarily speak bits and pieces of ghostly dialogue. Cunningham's novel hints at a tragedy of Aeschylean proportions. Constantine Stassos, the patriarch, barrels his way up through the strata of American society with a kind of rough hubris, making a fortune building cheap tract houses only to lose the family for which he labored. But the calamities that befall Con and his family have less to do with over-reaching than with each member’s inability to respond to his or her own needs or communicate with others. Mary, Con’s Italian-American girlfriend, marries him at 17 to escape from her impoverished home, not because she loves or desires him. From then on she squelches her emotions in the pursuit of a kind of Anglo-Saxon perfection, embodied in her mind by expensive clothes and an orderly house. Their three children live in isolated, confused worlds, out of which they rarely emerge to share longings or offer each other help. Susan embarks on a seductive relationship with her father, which, as she tries to reassure herself, is “only kisses. And hugs.” She makes a marriage as loveless as her mother’s. Scrawny, intellectual Billy is gay and for much of his life engages in a battle of wills with the father he both loves and despises. Zoe, a free spirit, is more attuned to her inner self than her older sister and brother, but she has the misfortune of coming to adulthood in the age of AIDS. In the novel, the shower of incidents mingles with Cunningham’s evocations of his characters’ private dreams and passions. In Gaitens’s adaptation, incidents abound but there is little space for showing the characters’ inner workings. Occasionally the play stops, while a character addresses the audience in the first person (Gaitens takes most of the language directly from the book). But by Act 2, when the newness of figuring out relationships has worn off, our presumed task is to follow the tracks of the main characters, their children, grandchildren, lovers and friends. Our absorption in the stories diminishes then, for the play feels like a catalogue of battles--a hundred years family war --rather than an exploration of people. The character of Con (John Sierros) suffers most. In Cunningham’s novel he is often bull-headed and brutish, but you understand his furies. You understand why this man, who arrived in America with no skills, barely speaking English, blows up when Billy (Peter Gaitens) insists on wearing jeans to his Harvard graduation and then, even worse, walks out on the whole affair. The play, by contrast, draws Con as a stereotype: a macho immigrant who has acquired the attitudes of homophobic America. Compare Flesh and Blood to Long Day’s Journey into Night, another American family drama playing New York this year. O’Neill, too, excavates the tormenting past and present of an immigrant family, the Irish-American Tyrones. But O’Neill condenses his saga. He is more concerned with psychological revelations, no matter how contradictory, than plot. He understands how one day and night can contain lifetimes. Musings and memory, rather than events, are O’Neill’s devices of choice. We learn more about the troubled Tyrones by listening to them writhe verbally than we do watching unhappy Stassos generations grow up, find and lose partners, and die. The proof is in the plays’ emotional impacts. At the end of Long Day’s Journey we experience indescribable loss and pity, which extends beyond the Tyrones to the unfathomable emptiness that, O’Neill believed, human beings share. At the end of Flesh and Blood we feel only an amorphous sympathy that so many lives have not come to fruition, and perhaps a vague hope for the future. This is not to suggest that Gaitens would have a better play if he adopted O’Neill’s techniques, only that Flesh and Blood, in its attempt to encompass the novel’s scope, fails to transfer the guts of Cunningham’s writing. There is material here for at least three plays, as Aeschylus would have known. If the form eventually wearies, the content does fulfill NYTW’s mandate. Over the course of a hundred years, the Stassos family changes and changes again. What begins as a supposedly ideal American unit, two heterosexual parents with three children, becomes a group that only post-modern urban America would recognize. Near the play’s end, Billy-–or Will, as he renames himself-–his partner, Harry (Peter Frechette), Zoe’s teenage son Jamal (Airrion Doss), and Mary (Cherry Jones) stand at the tip of Manhattan, torn between whether to visit Ellis Island or buy sneakers for Jamal in the East Village. Here, Cunningham and his emissary Gaitens seem to say, is a new type of American family: gay, racially mixed, parented by people who offer choice rather than control. They opt for a new pair of Nikes, leaving Ellis Island and the history of its immigrants behind them. The director Douglas Hughes asks his actors to fill the play’s interstices with true, affecting behavior, and they oblige. Cherry Jones is a wonder. She looks stunning in Paul Tazewell’s parade of suits and dresses, which mark both the changing decades and Mary’s emotional state. In Jones’ pure, unmannered performance, Mary becomes as tailored as her clothes. She grows tighter and more fiercely closed down with each passing year, although just occasionally, when Mary can no longer bear the pressure, Jones breaks out of the character’s cool demeanor and shows us a spasm of anger or unhappiness. But all the performances are strong. Martha Plimpton’s Zoe is a feral creature, as wild as her mass of untamed hair. Jessica Hecht acts Susan with a devastating mixture of hesitation and ferocity, and Jeff Weiss makes Zoe’s friend Cassandra, a drag queen with infinite knowledge, both funny and tender. They and the rest of the cast infuse the play with life, in defiance of the writing.